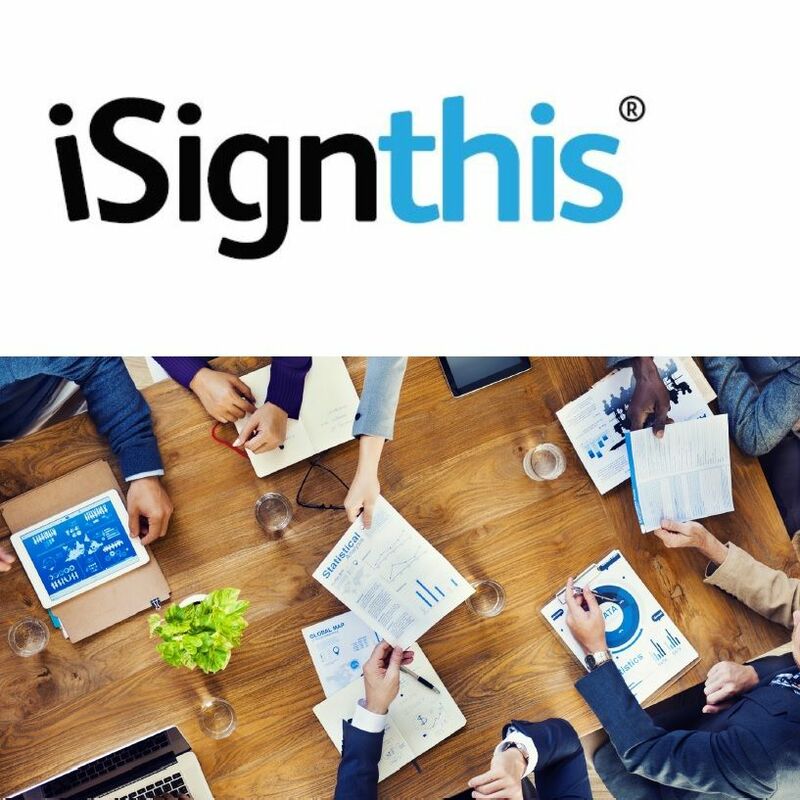 Melbourne, Nov 27, 2018 AEST (ABN Newswire) - Australian Securities Exchange and Frankfurt Stock Exchange cross listed iSignthis Ltd ( ASX:ISX) ( FRA:TA8) (the "Company"), is pleased to announce that it has completed its Tier 1 integration to access both Visa and Mastercard ("card schemes") directly, per its previously announced timetable on 30th August, and will be imminently using its own Principal Member Bank Institution Number (BIN) for processing of card transactions within the EU/EEA. 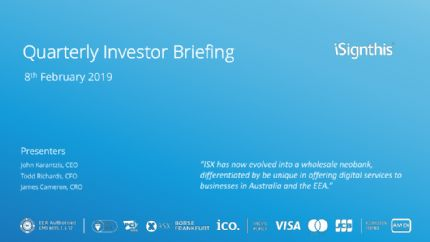 Visa and Mastercard, are as of tomorrow, both switched to Tier 1 'production live' by the card schemes, allowing direct processing by ISXPay under its own BIN, along with previously announced JCB. The combination of these three schemes alone represents a viable offering as an independent, standalone acquirer, and with our APMs and SEPA capability, will far exceed many EU payment companies' capabilities. The upcoming addition of our other principal licensed payment channels, including Diners, Discover, China UnionPay and Amex, will further augment ISXPay's offering and revenues from mid CY/FY2019, and positions the Company with a globally enviable choice of payment channels and capabilities. The Company has previously announced that it contracted more than AUD$880m of merchant GPTV, to be processed during FY/CY2019 and beyond. 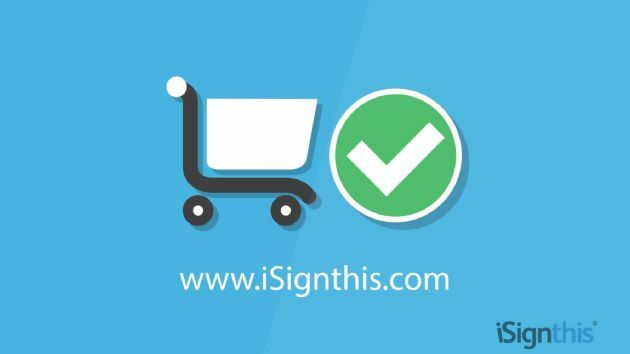 ISXPay will shortly start to ramp merchant volumes up, without the restrictions it previously faced working with other payment service provider partners. The Company will however, maintain strategic partnerships with other payment service providers, in order to offer specialty services. The Company expects that Gross Processed Turnover Volume (GPTV) will gradually be loaded to ISXPay over January and be at full GPTV monthly throughput by March 2019. The $880m annual GPTV will be subject to merchant and seasonal fluctuations during the course of the year, with some months performing stronger than others. GPTV volume ramping is non-linear accelerating post March 2019. 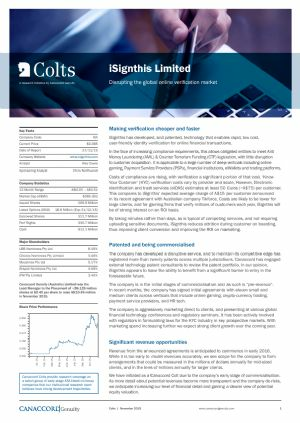 The Company is restating its EBIT guidance of ~AUD$10.7m for CY/FY2019. The target MSF% of >100bps is sensitive to volume pricing discounts, but is also subject to increases for lower volumes or specialty merchants. The "Merchant Services Fee (MSF)% x monthly processed GPTV" will be booked as gross profit each month, without any cashflow lag, as MSF is deducted at daily or weekly settlement to merchant. The Costs of Goods line will soon largely exclude the underlying percentage cost that has been payable to partner payment services providers during previous quarters for use of their networks. The overwhelming majority of ISXPay's merchants fall under MCC6211 (CFD/FX Brokers & Market makers), many of whom also utilise the Paydentity(TM) platform to meet their compliance requirements. Consistent with our strategy of supporting the FX sector, ISXPay offers merchants a large range of acceptance and settlement currencies, including AUD, GBP, CAD, CHF, CZK, DKK, EUR, HKD, JPY, NZD, PLN, RUB, SGD, SEK, USD and ZAR, with acceptance in a further 150 odd currencies, settling in EUR.